How to crochet for beginners gives you some video tutorials to get you started plus a collection of easy projects to make with your new skills. I love crochet. Last week I shared my Pinterest board with lots of crochet ideas. (By the way, I love Pinterest, too!) The lovely Kate from Picklebums asked about learning crochet and how hard it might be. It really isn’t that hard once you get the hang of it – like most crafts, I suppose. So I’ve put together a little collection of YouTube clips to get Kate (and you!) started. There are lots of different granny squares out there so do a search for more designs. Flowers are another relatively simple thing to try. 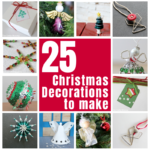 You can use them to decorate other items, make a garland of them, or make tiny ones with embroidery thread and use them as scrapbooking embellishments. I have been working on a ripple blanket using this pattern. But here’s a tutorial for a more basic straight pattern. You can also make blankets by joining your granny squares. My Rainbow Blanket would be an easy one for a beginner too. There are many more ideas and patterns out there on YouTube and various blogs, but hopefully these will get you started. ooooh what a fabulous list of tutorials!!! Ok now I need to go get me a hook and some wool… oh and some time! LOL Thanks so much!!! Lovely list of vids there! I was lucky enough to have a mad crocheting grandmother who taught me (and my mother helped too) so I have been a lifelong addict of crochet and am currently into all those little amigurumi toys for my little boy (and much to my relief he loves them – so far!). Am so pleased that crochet is becoming cool again!! What a great compilation of videos! Seeing it visually with real hands is so much better than photos or diagrams. Great job! I agree, Melanie. I find seeing someone do something is helpful, especially if I just need a little refresher. I would love to make ripple blanket like you made someday. I love how it turned out. The colors are infectious and I can just imagine being able to snuggle up in style with it come Winter. I added it to my DIY Daily page on my blog. ooh! Following your boards now! Love your ripple blanket! Thanks for sharing! What a great beginners crochet tutorial! My grandmother taught me as a child and this was such a great refresher. Thanks so much! I really love this newsletter. I haven’t got much time right now but I’ve just had a quick look through and at some of your crochet info sections. Just read the quick lacy shawl one that you made up yourself, and I just had to take the time to write and tell you how brilliant it all is. I, for one, really do appreciate all the effort you must put into getting it all down and online so that those of us who are not experienced, can learn and create wonderful new stuff. Thank you ever so much for that. I’m defo going to have a go at something soon and will take immense pleasure doing so. Without people like you, who give/share so much of your experience, people like me would remain forever stuck doing the same old stitches and mistakes I’ve always made. I’ve only ever known granny squares and more recently, double crochet – so learning new techniques and fixing my errors is such a delight to me. Keep all the great work you do coming and you deserve one great big pat on the back for teaching me how to try new stuff. YOU ARE BRILLIANT, YOU REALLY ARE. ???????? Thank you, Andrea! You just made my day! !